Single Balewrappers: 1700SR & 1000R. It is known that if you do not wrap bales you can expect to lose 1/3 of that bale due to factors like spoilage and livestock sorting out the good parts of your bale and leaving the rest, so start thinking about wrapping hay with a Tubeline inline Balewrapper. It can save you time and money, and is simple to operate with one operator. And standard features that include quick set up where you tow into position, fold away tongue, place and wrap end capped bale, lower deck and start wrapping! Other features are standard like easy access to engine, large fuel tank, roller wheels, and limit switch, which can allow one person to get the wrapping job done. The NEW for 2019 TL60 Wrapper features a soft start and will wrap both round and square bales. The NEW for 2019 TL50 Wrapper features a soft start and will wrap round bales. The TL6000 model will wrap round bales up to 6' and square bales up to 3'x3'x6'. The TL6500 model will wrap round bales up to 6’, single square bales 4’x4’x6’ and 3’x3’x7’ OR double stacked square bales up to 3’x4’x6’. Tubeline also offers ECV balewrappers which build upon the proven success of the AX2 wrappers, but has digital control and easy to use presets and bale counters, custom operators love these machines. To Learn more, Click Here. ​The TL1700SR trailed bale wrapper will wrap BOTH Square AND Round bales! This is a trailed unit that will wrap 3’x3’ square bales from 4feet to 7 feet long and 4’x4’ & 5’x5’6” round bales- making it versatile for whatever kind of bales you need to wrap. This is perfect for small to medium sized producers and custom operators alike. This bale wrapper features a twin wrap kit that uses 2 rolls of 30” film to wrap the bales quickly. It is hydraulically powered, has a wrap cutter, and is made by the trusted inline bale wrapper masters, Tubeline Manufacturing. Are you looking for an easy to use, easy to maintain single Balewrapper? Now you can wrap your hay easier, up to 5X5’6” diameter bales with the Tubeline TL1000R Balewrapper. This easy to use Balewrapper uses tractor hydraulics to spin and rotate the bale while it’s being wrapped so that each bale is wrapped completely and evenly every time. The TL1000R keeps the bale on with bale guides and features a bale counter to ensure your desired amount of wraps. The film width of this single Balewrapper is 30. The HP required is only 30HP. The three point hitch is a category II. The TL1000R single Balewrapper unloads the bales easily by lifting the 3PH and sitting the bale down. This single Balewrapper is simple to use and is priced at a number you can afford! This single Balewrapper could transform the way you operate your farm and save you money by not losing hay to mold or livestock sorting. 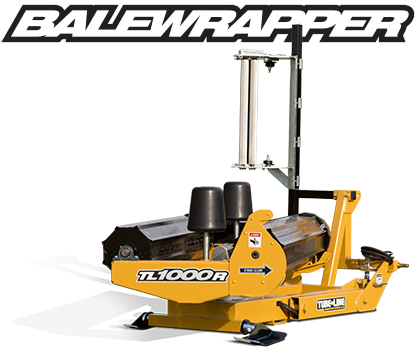 The TL1000R single Balewrapper will wrap both 4ft or up to 5’X5’6”as stated above, a feature which some other single Balewrapper do not. The TL100R single Balewrapper changes easily from 4ft to 5ft by moving the bale guides. So if you have big round bales that you need wrapped, this machine is affordable and efficient and is manufactured by the same people who bring you the best inline Balewrapper in the business, Tubeline Manufacturing. So whether you need to wrap single bales for sales, for feed, because they are easier to store if you have limited space, or because a single Balewrapper is less expensive, you can rest assured that the TL1000R will not disappoint and will handle the job you need done in hay wrapping. ​The BaleLiner from Tubeline transforms round bale handling and wrapping into a one man operation. BaleLiner is a system that combines Tubeline’s proven balewrapping performance with a rugged self-loading 8 bale transporter. Now you can setup, retrieve, wrap and roll onto the next field with only one tractor. The BaleLiner not only moves bales, it also transports the wrapper from field to field by piggy backing the unit with no extra equipment needed.